Click Here for a Very Short Clip with Trump telling Schumer "I will shut down the government if there is no money for border wall." 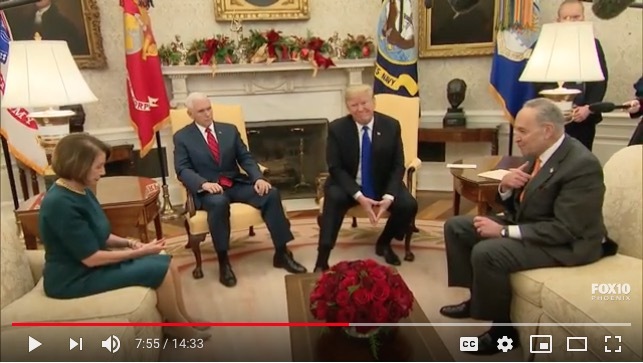 Click Here for the entire exchange where Pelosi and Schumer tell Trump that walls don't work and much more! Call the White House Switchboard NOW at 202-456-1414 and ask them to note that you support President Trump's decision to shut down the government if there is no wall funding. Then tell them that not only should he shut down the federal government, EVERY "non-essential" government employee that is identified in the shut down should have their job eliminated immediately!!! Watch the video and listen to the idiotic arguments by Pelosi and Schumer claiming that imaginary "experts" say walls don't work. It's real simple - NO WALL FUNDING, no Government funding. When they try to scare you about how "cruel" it will be to have a shut down at Christmas time LAUGH IN THEIR FACE and expose them for the frauds that they are! Like we don't know that nothing important gets shut down and the laid off employees get a PAID VACATION and all there wages back at the end of the shutdown. You can tell by how much Pelosi and Schumer keep saying they don't want a government shutdown that they will cave if the President holds firm. He will hold firm if he has our support! Call the White House Switchboard NOW! BTW, I have confirmation that our ad was seen in the White House. Don't know for sure if the President saw it or not, but his staff definitely did. I also know lots of "Republican" Congressmen saw it. Our timing could not have been better! Thanks to all of you who shared it and donated to help pay for the ad.